In line with its legacy of introducing quality products into the market, BMR has launched its own range of shrimp healthcare products (HCPs) in June 2018. Developed in technological partnership with Jianyuan, China, the BMR HCPs stand for quality and performance. Currently, there are seven different healthcare products that address the various issues of pond quality and shrimp health. Made from herbal sources and extracts, the BMR HCPs come with zero side effects and help farmers in reaping successful harvests. 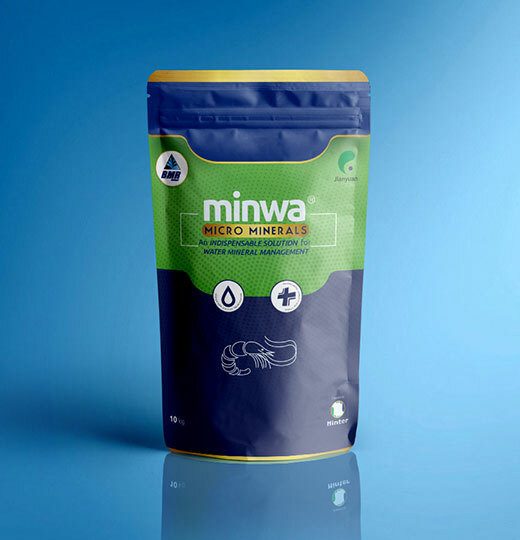 Minwa is a unique combination of major, micro and trace minerals that help the farmer to maintain balanced water quality, while promoting successful shrimp culture. It protects the animal shell and improves hardness. It helps in water algae growth and development that is useful for the culture. Increases total alkalinity of pond water. Improves growth and development of algae. Protects shell and improves hardness. Bacto Clean is your solution to resistant pathogenic microbes in the pond bottom. 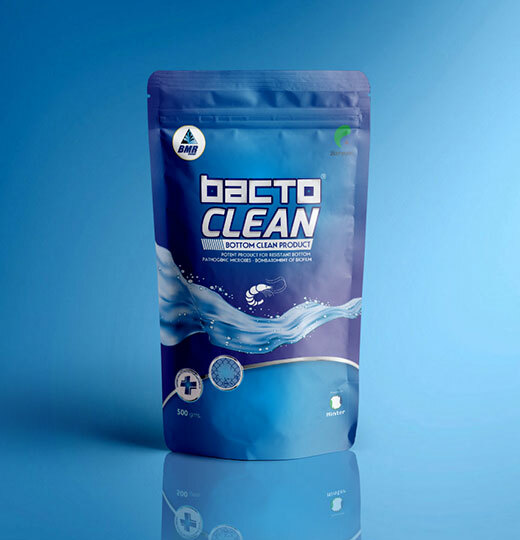 Bacto Clean acts like an explosive and bombards the biofilm created by the microbes, thus reducing the pathogen activity. It rapidly oxidizes the bottom sludge by degrading the toxins and improves the water quality. Removes the bottom pollution and degrades the toxins. Rapidly oxidizes the bottom sludge and residual feed. Eliminates dark colour of the soil and improves the soil colour. Helps in decomposing the accumulated waste material and reduces the pathogen activity. Helps in reducing water turbidity, viscosity, odour and foam, thus improving water quality. 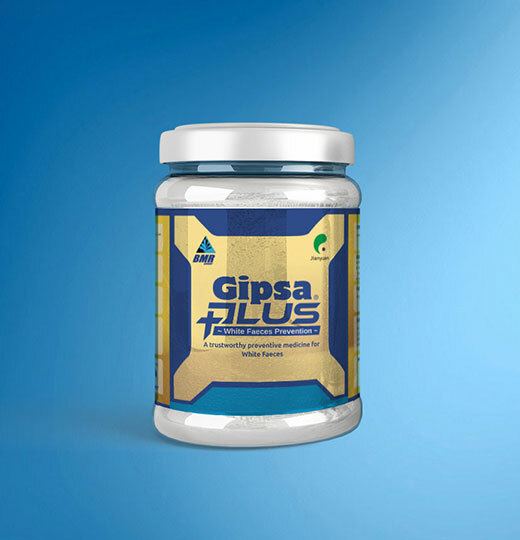 Gipsa Plus is the trustworthy preventive medicine for preventing white feaces in shrimp and gut health. It helps in effective feed utilization even during the white feaces stage. Prevents and controls white feaces disease in shrimp. Improves feeding even during white feaces disease existence in shrimp. 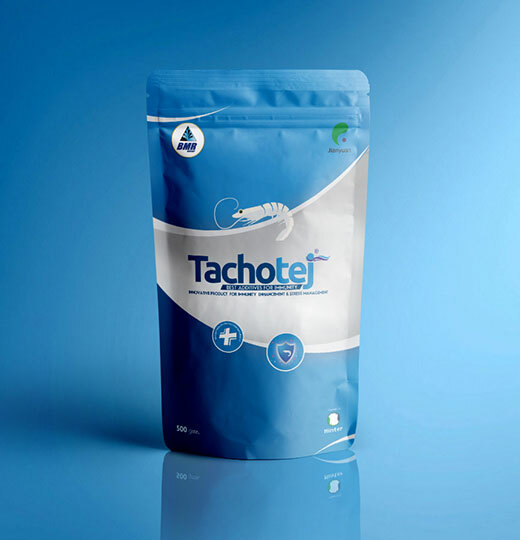 Tachotej is aqua farmer’s best friend when it comes to improving shrimp immunity. It helps the shrimp to maintain immunity to dominate the threats from other living creatures in the pond. BMR Tachotej improves the animal appetite for increased feed intake. It also helps the shrimp in stress management. Activates immune system regulation mechanism. Protects from harmful bacteria and virus. Helps in improving overall animal health and growth. Note: During white feaces problem, Tachotej must be given along with GIPSA PLUS to help the shrimp recover from the disease quickly. For more details on usage, consult the local BMR feed staff. BMR Biota plus has strong oxidizing ability and can remove toxins like Hydrogen Sulphide (H2S) released during decomposition of residual feed and feaces. 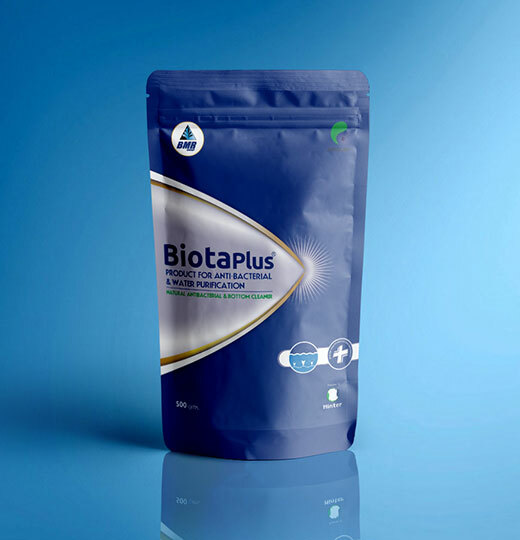 Once added in the pond, Biota plus quickly releases oxidizing substances in to the water. It helps in reducing / eliminating vibrio and other harmful bacteria in the water. Kills harmful bacteria in water. Removes toxic Ammonia, Nitrogen and Hydrogen Sulphide (H2S). Makes the pond bottom clean. Oxidizes the organic compounds, residual feed and feaces. 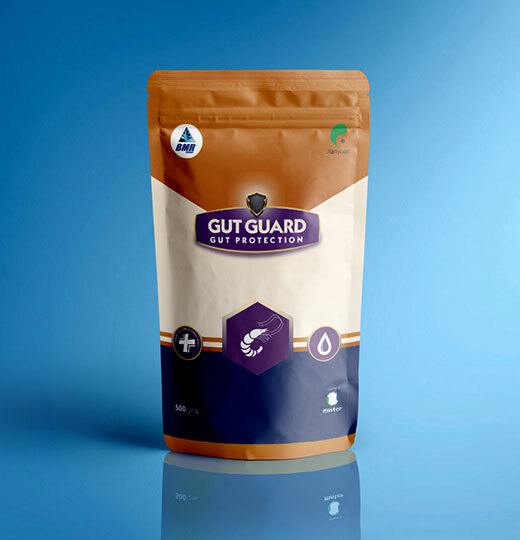 BMR Gut Guard protects the digestive system of the cultured shrimp. It improves feed intake and digestion in the gut. BMR Gut Guard also heals the hepatopancreas swelling as well as white hepatopancreas of cultured shrimp. Protects the animal’s digestive system. Helps in promoting feed intake and digestion. 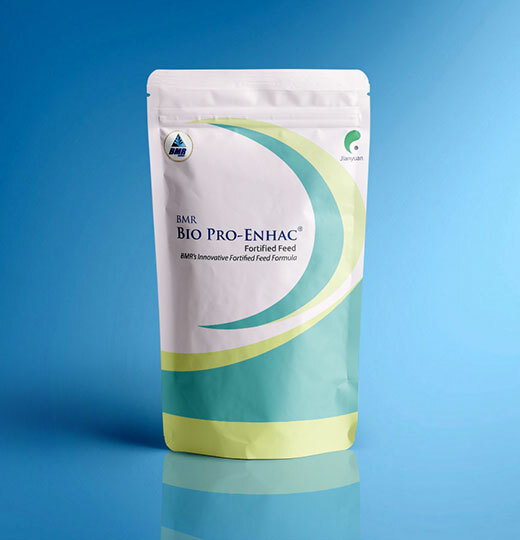 A unique fermented feed from BMR, Bio Pro-Enhac contains rich strains of lactic acid bacteria which are beneficial to the development of shrimp. It is one probiotic for that offers three benefits: (i) improving water quality; (ii) improving soil quality; and (iii) improving the immunity and overall health of the shrimp. Promotes early stage development and improves shrimp activity. Promotes the abundance of algae and stabilizes the pond pH. Promotes digestion and feed conversion. Has special fermentation flavor for attracting the shrimp towards the feed.